Even though his fate is the primary driver of the plot, Turturro's screen time is relatively minor. But he makes the most of it, and this may be my favorite performance of his. The dark comedy here is superb and there are tons of layers to the plot and thematic elements. I didn't really connect with Tom, however, which was a big sticking point. Lots of names to remember to follow the immaculately crafted narrative and dialogue - and a film mostly about the breathing space between opportunism/planning and how loyalty and betrayal seem like two sides of the same coin; survival. Very engrossing and entertaining. What's the rumpus? I love the Coen brothers' sense of humor and how differently they deploy it in everyone of their films. Caricatural characters, heck yeah, Byrne and Turturo and Buscemi doing an awesome job, as usual. And what about that cameo from Frances McDormand? Oh God, i bet they just threw that in there, just for fun. Certainly a cut below the usual Coen gold for me. Felt a little bit forced at times, bogged down by dense uneventful dialogue and a plethora of characters that are less memorable than they are essential for the plot progression. There is still quite a bit of magic here, namely from Turturro and Freeman - who are given some of the darkly comedic touch of genius that the Coen's have trademarked. Worth a watch. From the stylization to the extent when a right-hander carries a tommygun with the left hand just for the sake of symmetry in frame, to the writing which, while being good with its mystery, tolerates stereotypical characters, to the cinematography stuck within the shot-reverse-shot scheme, there is a lot of space for nitpicking. 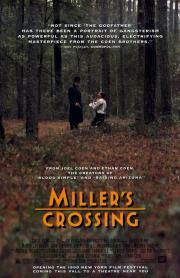 Still, it is one of the better movies, which has made me want to rewatch Coens' works I have not seen since childhood. R - A really good gangster film, but somehow missing some of the Coens usual magic. Some standout scenes, especially the Danny Boy escape. The custom-design is incredible and the screenplay is good, but there is a certain cold detachment about this film which made it sometimes uninvolving and a bit dull.